European explorers first came across what is today South Dakota in 1742 with the La Vérendrye brothers. The explorer duo buried a lead plate and effectively claimed the land for France, despite the presence of the Arikara and Lakota Sioux people who populated it. The land was transferred to US control in the Louisiana Purchase, headed by Thomas Jefferson in 1803 and explored by the Lewis and Clarke expedition. It wasn’t until 1817 that the first official settlement, Fort Pierre, was erected on the west bank of the Missouri River, and the state truly began to develop. A military expedition headed by the ill-fated George Custer discovered gold in the Black Hills in 1742, bringing on an onslaught of fortune-hunters. Crossing illegally into land promised to the Lakota Sioux, self-styled miners created major tension between the settlers and the tribe. War broke out as the Lakota Sioux refused to grant mining permission and the US failed to keep miners from entering the land. This war ended with the defeat of the Sioux and the breakup of the Great Sioux reservation into five reservations. The Lakota are still trying to get their stolen land back, refusing any offer of monetary compensation. As the population grew, the Dakota territory was split into North and South and in 1889 were admitted to the Union as the 39th and 40th states in an unrecorded order. A year after being granted statehood, one of the most grievous events in the state’s history befell the Lakota Sioux nation. At Wounded Knee more than 250 Lakota men, women and children, many unarmed and fleeing were shot down in a struggle that ensued during an arms confiscation by the military. The Wounded Knee Massacre was a tragic product of building tensions and mutual distrust between the government and the indigenous people. In an effort to promote tourism, 1927 saw the start of the Mount Rushmore National Memorial in the Black Hills. 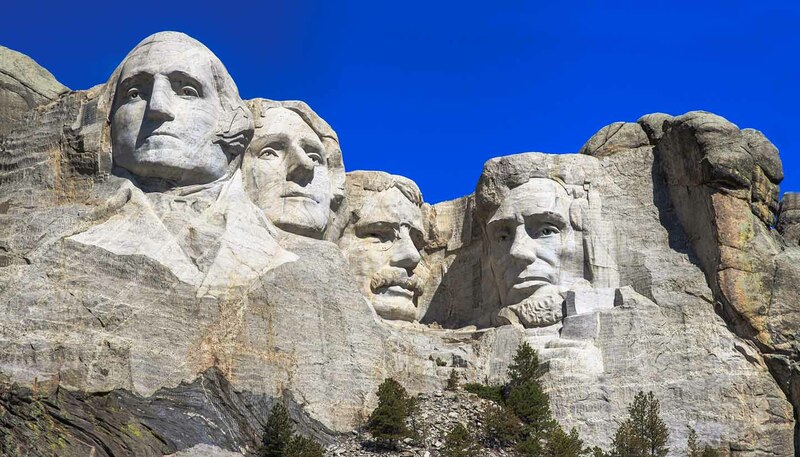 The likenesses of presidents George Washington, Thomas Jefferson, Theodore Roosevelt and Abraham Lincoln were carved into the mountain – each face is 18m (60ft) tall. Completion took 14 years and set the state back US$989,990. They succeeded however, as Mount Rushmore is now one of the US’s major tourist attractions. Three years into the carving of Mount Rushmore, South Dakota suffered from a terrible drought, coupled with the Great Depression culminating in the Dust Bowl. Massive emigration ensued as out-of-work Dakotans set out looking for a new source of income. Between the 1930s and 40s the population dipped by more than 7%. WWII bolstered the US’s economy and brought South Dakota back to stability. The state that had traditionally relied on agriculture, started to diversify its economy. Rural areas struggled to survive as small family-owned farms couldn’t compete with mechanization. With the diversification of economy, South Dakota has emerged from being a solely agricultural state. It still identifies closely with its history and agricultural roots, but new economic opportunities have sprouted in South Dakota. However, rural areas struggle as younger generations emigrate to bigger cities. The dominating religion of the state is Christianity (protestant and catholic) and minority groups of religion include Judaism and Lutheran. Religious buildings in the state include St John's Catholic Church in Dallas and Emmanuel Episcopal Church in Rapid City. In South Dakota, religion is an important factor of every day life and people attend church frequently. Much of the culture in the state stems from a rural, western history and this is celebrated by numerous events celebrated throughout the year such as the Redwall Canyon Cowboy Music Festival. There are common misconceptions that the state is not quite up to date with the latest technologies and that every other citizen must be a farmer. However South Dakota is one of the most diverse states in the US in terms of economy and landscapes. A very high proportion of the state's residents speak only English is the main language, although some Native American words have made it into common parlance. A small minority also speak German.